In the fall of 2014, ChamberMaster surveyed chamber of commerce executives from across the United States to determine business trends & projections for 2015. The hundreds of respondents represented a variety of chambers, from small, rural groups to large, urban organizations. The survey asked questions that covered chamber operations, collaboration with other chambers, member management, and plans for 2015. It also drilled into the challenges expected in 2015, trends that affect members and the chamber, and time spent recruiting new members and retaining existing members. Member engagement is critical in order for a chamber to thrive. When member engagement rises, volunteerism increases, membership grows, and as a result, dues can increase to fully fund operations. Only 20% of chambers use an ultra-efficient all-in-one tool to manage member data. The biggest business impacts projected for 2015 include the way the internet and mobile devices affect small business operations, an economic recovery with less job growth, and increased government effects on the local economy. Chambers manage many initiatives, from a traditional chamber of commerce to leadership groups, tourism center, economic development, etc. Only 1/3 of chambers earn revenue through website ads. Based on the survey results, a key focus area for chambers in 2015 needs to be member engagement, with special attention given to the engagement level of younger members. As the chamber grows, it will be able to operate more effectively and efficiently by using tools available within the industry. The more successful the chamber becomes, the more members will value it and be willing to invest themselves in the group. All it will take is the right focus on increased engagement. 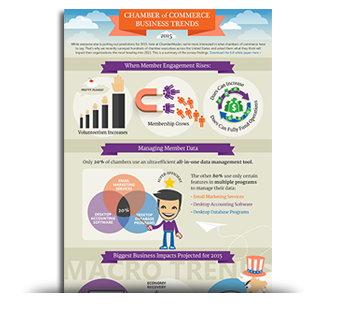 For your copy of the chamber results white paper and infographic simply click here now.